The reawakened interest in competition issues in agricultural markets might appear to have found its ideal poster child in the seed industry. Concentration is high and market structure has shown remarkable dynamics over the last 15 years, with high-profile mergers and acquisitions by key players. A dominant firm—Monsanto—seems to have emerged, at least from the perspective of biotech traits perceived as essential in modern seed varieties. The two largest U.S. seed companies, DuPont and Monsanto, have embarked on a tough legal battle. And the Department of Justice (DOJ) has opened a formal antitrust investigation of Monsanto practices. Yet, despite its many motives of interest, the seed industry’s competition issues are probably not representative of what matters in other agricultural markets. A distinctive feature in the seed industry is that innovation is crucial and heavily dependent on sizeable research and development (R&D) investments. Commitment to R&D by private firms, in turn, relies crucially on the existence and enforcement of intellectual property rights (IPRs), patents in particular. Strong IPRs necessarily confer limited monopoly positions. Whereas that is well understood and widely accepted as a reasonable method to promote the provision of innovation by the private sector, there remains an inherent tension between IPR and antitrust concerns in this industry. Agricultural research can claim remarkable achievements over the last century, with impressive productivity gains that have ensured the availability of an abundant and safe food supply that meets the needs of a growing world population. Celebrated successes such as those underlying the Green Revolution owe much to public funds supporting research in public institutions. But the current structure of R&D is much more dependent on private investments. In the U.S. economy, industry R&D at present accounts for more than two-thirds of total R&D investments. 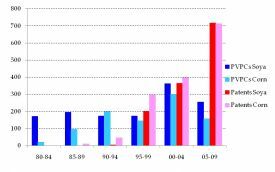 More specifically, in agriculture, private R&D has exceeded public R&D expenditures since the early 1980s. To feed a growing world population, and to meet the competing demands on land from bioenergy, it is apparent that continued productivity growth is essential. Inasmuch as that depends on new and improved seed varieties, the heavy lifting will have to be done by private R&D investments, and the availability of secure, enforceable, and strong IPRs is, arguably, a necessity. Knowledge is the quintessential public good—nonrival in consumption and, in and of itself, nonexcludable. Absent IPRs, it is clear that firms have little incentive to engage in expensive R&D that can create new and useful knowledge. Why undertake the costs of being an innovator if one can wait for others to do that and reap the same benefits by copying and imitation? The prospect of such destructive “free riding” behavior has long been acknowledged, and most developed economies have implemented strong legal measures to protect the rights of inventors. For plants, in the United States such measures include protection of trade secrets, the 1970 Plant Variety Protection (PVP) Act and—following the landmark U.S. Supreme Court decisions in Diamond v. Chakrabarty (1980) and J.E.M. Ag Supply v. Pioneer (2001)—utility patents. The latter provide the strongest protection and are now routinely used for biotechnology research tools, genetically modified (GM) traits, and traditional germplasm. Patents grant to the innovator the right to exclude others, for a limited time period, from using the patented product or process. Such exclusionary rights can be a source of considerable returns if there is a strong demand for the innovation because it effectively allows the patent holder to behave as a monopolist. It is the prospect of such returns that provides the needed incentive for investment in R&D (Langinier and Moschini, 2002). Of course, this market solution to the problem of promoting innovation is second best in nature: once the innovation is available, the patent actually restricts its use and it is a source of (ex post) efficiency loss. Seed companies need property rights to justify their substantial R&D investments. For example, the prospect of farmers saving a portion of their harvest to use as seed in the next period obviously reduces the ability of suppliers to recoup the cost of improved seeds over many growing seasons. Prior to the possibility of using patents to prevent that, it is not surprising that the crop that attracted most private R&D investments was maize—saving seeds does not work well with hybrid varieties. The development of a vibrant maize seed industry owes much to the natural property rights protection offered by the hybrid technology, over and above the remarkable discovery of the productivity effects of hybrid vigor. But patent protection is now available on many aspects of seed production, including GM traits and varieties, and that has tremendously enlarged the scope of profitable private R&D investments in the seed industry. Indeed, patents have been crucial to the commercialization of modern biotech varieties. Seed suppliers can market elite varieties, embedding herbicide and/or insect resistance traits, and charge a price premium, without the fear that others might misappropriate the product and compete unfairly in future periods or that farmers might save a portion of their harvest for replanting, thereby negating a market for the product for future periods. The nature of innovation in the seed industry has been radically affected by the biotechnology revolution in agriculture, a development that has produced exciting innovations as well as some unexpected and unresolved problems (Moschini, 2008). Specifically, modern seed varieties of major crops, such as corn, soybeans, cotton, and canola, derive their value to users from two sources that are both essential: germplasm and GM traits. The latter, of course, refer to the traits engineered by insertion into plants of foreign genes—typically single genes, which may however be stacked—that confer a desirable attribute, such as herbicide tolerance or insect resistance. Germplasm refers to the sum total of all hereditary material in a plant, as coded in its DNA. For a crop, it reflects the compounding nature of sequential improvements carried out by breeders over a long period of time, all of which, of course, is encapsulated in the seed. Not surprisingly, commercial breeders are keen on protecting the results of their efforts from misappropriation, and a complex set of IPRs has emerged to help them do so. The 1970 PVP Act allowed for the creation of patent-like “certificates” for new, distinct, uniform, and stable varieties. This sui generis IPR protection was developed at a time when it was believed that living organisms did not constitute patentable subject matter. But all that changed in 1980 with the landmark U.S. Supreme Court decision of Diamond v. Chakrabarty. It is important to understand that utility patents can now be used to assert germplasm ownership for traditionally bred varieties, and not just for GM traits. Other IPR protection instruments that are relevant to the seed industry include trade secrets—which have been effectively used for maize inbred lines in a few high-profile litigations—and material transfer agreements. Because patents provide a stronger protection than PVP certificates (Moschini and Yerokhin, 2007), breeders have started to favor their use. 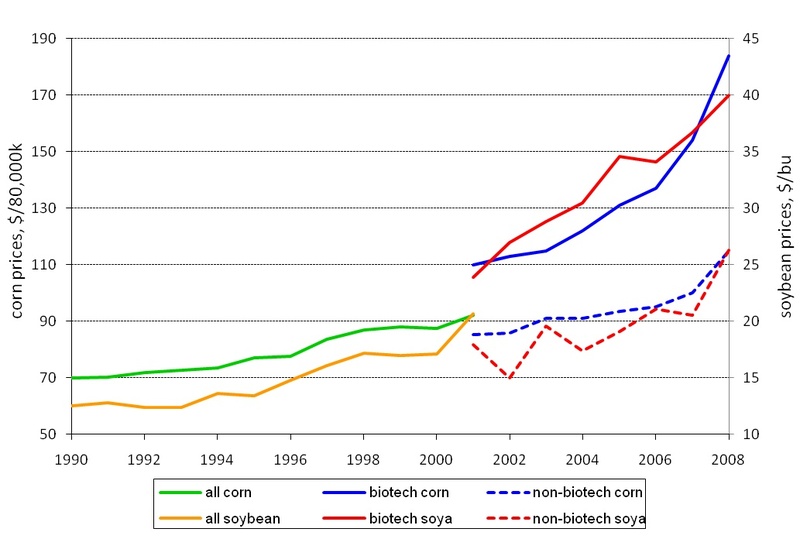 Some evidence in this respect is shown in Figure 1, which reports the number of PVP certificates and patents on varieties, issued over the 30-year period ending in 2009, for both corn and soybeans. Specifically, such counts are reported as total for five-year periods, to smooth out year-to-year variations partly due to the vagaries of the approval process. It is clear that, in the most recent half of the period considered, the use of utility patents for plant varieties has increased considerably. In the last five years, in particular, the number of variety patents issued for corn and soybeans far exceeds that of PVP certificates. Monsanto was not in the seed business prior to the advent of agricultural biotechnology, and it is now the largest seed company in the world. This remarkable evolution has its roots in the advent of agricultural biotechnology and the ability to engineer crops with herbicide tolerance and insect resistance traits (Economist, 2009). Such novel possibilities held the potential to profoundly affect farmers’ demand for herbicides and pesticides, not just seed, and brought about a confluence between the agrochemical and seed industries. Monsanto invested early and decisively in agricultural biotechnology, leading to the release of GM varieties, first commercialized in 1996. Its early advantage and continued commitment to this R&D path has resulted in a dominant position in the GM traits found in commercialized varieties of soybeans, cotton, and corn. This is illustrated in Table 1, which is based on data made available by Monsanto to its investors, but percent values in this table are calculated based on USDA planted acres. 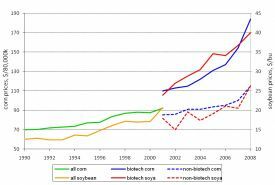 Note that the share of U.S. grown crops containing one or more Monsanto traits has increased steadily over time. In 2009, this share amounted to 81.1% in corn, 94.5% in soybeans, and 78.9% in cotton. GM traits such as herbicide tolerance or insect resistance are attractive to farmers because they offer both cost-reducing and yield-increasing opportunities. But clearly, to capitalize on this latent demand, GM traits need to be embedded into seed varieties available to farmers. To achieve the market penetration in GM traits illustrated in Table 1, Monsanto appears to have followed a two-pronged strategy. First, it acquired several seed companies that offered both a solid germplasm base and a recognized brand name, including Asgrow for soybeans in 1997, Dekalb for corn in 1998, and Holden’s Foundation Seed—a firm supplying corn inbred lines to other breeders—in 1997. These acquisitions provided an immediate, sizeable presence in the seed market and a vehicle to market its GM traits. Second, from the beginning Monsanto engaged in broad licensing of its GM traits to other seed companies, from small regional firms to large competitors. This broad licensing strategy leveraged the stock of elite germplasm held by other companies, as well as their seed commercialization channels, and thus allowed GM traits to be made available to more farmers much more quickly. This successful strategy, of course, relied on the credible threat of a do-it-alone alternative made possible by the earlier seed company acquisitions, which also gave Monsanto considerable bargaining power in defining the clauses of its licensing agreements. The foregoing discussion suggests that ownership of the germplasm is just as critical as the ownership of GM traits in order to understand the current status and possible future evolution of this industry. Table 1 provides some indications of the dominant position in GM traits accumulated by Monsanto, although one should note that other companies—including Dow AgroSciences, Syngenta, and DuPont—have competing GM traits that have been commercialized or are set to come to market. Conversely, Table 2 provides an indication of germplasm ownership by looking at utility patents for inbred lines, cultivars, and varieties for corn and soybeans, over the last 15 years. These are the patent count data used in Figure 1; soybean patents for which Monsanto and Stine are joint assignees are counted as half for each. Grouping these patent counts by company, accounting for the various mergers and acquisitions that took place over this period, Table 2 illustrates the dominant position of the top two companies, DuPont and Monsanto. The table also suggests the weakness of Dow, a company that has developed successful insect resistance traits but which apparently does not have a comparable strength in germplasm platforms. Stine is a newer company that has focused its energy on soybean breeding. Also apparent is the absence of the public sector in patented germplasm, perhaps surprising given the general trend of increased university patenting promoted by the 1980 Bayh-Dole Act. Neither Table 1 nor Table 2, of course, depicts market shares in actual commercialized seeds. On that front it is thought that the top two companies currently have comparable strength in corn and soybeans. For 2009, industry sources put Monsanto’s share of the corn seed market a bit above one–third, DuPont’s share a bit below one–third, with Syngenta a somewhat distant third with perhaps 7-8% of the market. In the branded soybean seed market, in 2009 Monsanto’s share was near 30%, DuPont’s share a bit lower but in the 25-30% range, and Syngenta again third with about 10%. Both IPR laws and antitrust laws share a common ultimate objective—to increase efficiency and thus improve the welfare performance of a market economy. But efficiency considerations in an innovation context are subtle, and there remains an unresolved tension between the prescriptions of IPR and antitrust laws. IPR law aims at increasing welfare by promoting innovation. For this purpose, the grant of exclusivity is crucial in providing incentives for private R&D. And, exclusive control of an innovation necessarily confers some market power. Antitrust law aims at increasing welfare by promoting efficiency. Whereas monopolistic positions are not prohibited per se, certain activities that lead to the acquisition or exercise of market power are banned. From the perspective of IPRs, taking an ex ante perspective is of paramount importance, and it is recognized that to obtain dynamic innovation gains one may need to incur, ex post, some static efficiency losses. This trade-off is inherent to the second-best nature of IPRs, but it is a profitable bargain for society, a result that is robust even in the sequential innovation setting that characterizes crop breeding (Moschini and Yerokhin, 2008). But ex post, from the perspective of antitrust practice, monopolistic positions that result from IPRs are quite visible, and sorting out what is a legitimate exercise of IPR-related exclusivity from exclusionary practices that are proscribed by antitrust statutes remains difficult. The objective of combining GM traits and germplasm held by different parties gives rise to the need for licensing agreements that are typical of so-called technology markets. Licensing in this context is generally held to have procompetititve effects because it facilitates the integration of complementary factors of production that are essential to assemble a product that has market value. But it is well known that restrictive and exclusionary licensing arrangements may run afoul of antitrust rules. The Antitrust Guidelines for the Licensing of Intellectual Property issued by the DOJ and the Federal Trade Commission (FTC) attempt to clarify this tension (DOJ and FTC, 1995). These agencies “recognize that intellectual property licensing allows firms to combine complementary factors of production and is generally procompetitive,” they “will not require the owner of intellectual property to create competition in its own technology,” and note that “the fact that intellectual property may in some cases be misappropriated more easily than other forms of property may justify the use of some restrictions that might be anticompetitive in other contexts.” But they also note that the per se illegality of a number of restraints—such as price fixing—continues to apply to the licensing of intellectual property. Furthermore, other restrictive licensing practices, such as exclusive licensing, exclusive dealing, and tying arrangements may be found to violate antitrust under the rule of reason, notwithstanding the recognized distinctive attributes of technology and innovation markets. Farmers benefit from improved seed varieties because of increased expected yields and, with GM traits, cost-reducing production practices—for example, reduced need for pesticides with Bt varieties; simpler and less expensive weed control with herbicide tolerant plants. But such benefits come at a price—indeed, collecting a higher seed price from farmers for improved seeds is a necessary component of the model whereby users pay for the underlying R&D carried out by seed and agrochemical companies. The exclusivity granted by IPRs allows the innovator to charge a higher price for the improved seed. Just how much depends on a number of issues, including whether the innovation is drastic or nondrastic and whether or not the preinnovation industry is competitive (Moschini and Lapan, 1997). Not surprisingly, therefore, we have seen higher prices for biotech seed varieties. Some insights are revealed by data available from the US Department of Agriculture (USDA), which started to report separate prices for biotech and nonbiotech seed varieties in 2001. Such price data, for corn and soybeans, are reported in Figure 2. It is clear that, for both of these crops, seed prices have increased considerably since the introduction of GM crops in 1996, for both biotech and nonbiotech varieties. Simply comparing the last available year (2008) to the pre-GM year of 1995, we see that the total seed price increase over this period is 139% for biotech corn, 49% for nonbiotech corn, 199% for biotech soybeans, and 96% for nonbiotech soybeans. Also of some interest is the price markup charged for GM seeds, relative to nonbiotech varieties. Based on the aggregate data reported by the USDA and used for Figure 2, for corn this markup has increased from about 29% in 2001 to 60% in 2008. Arguably this reflects, among other things, the increased importance of stacked traits in GM corn seed varieties, which now commonly combine herbicide resistance with a few insect resistance traits, such as against corn borer and corn rootworm. The situation is somewhat different for soybeans, in which biotech varieties over this entire period have simply contained the same herbicide tolerance traits. Monsanto’s marketing strategy for its Roundup Ready trait at first singled out the markup as a distinct technology fee, initially $5 per bag and then $6.50 per bag. But in 2001 Monsanto replaced this technology fee paid by growers with a royalty system paid by the seed companies licensed to use the trait, leaving the companies with more flexibility on pricing their product. Coincidentally with this change, it is apparent that the markup for essentially the same herbicide tolerance trait in soybeans increased substantially. This markup, which amounted to about 40% of the seed price under the technology fee system prior to 2001, has averaged 70% over the period 2004-2008. For some of the main U.S. crops, the consolidation that has occurred in the seed industry over the last 15 years has been accompanied by remarkable changes driven by the advent, and strong adoption, of GM crops and by the increased role of IPRs. Monsanto played a pioneering role in the development of GM traits and at present enjoys a dominant position in such a technology market, although other companies have developed or acquired a growing set of competing products. 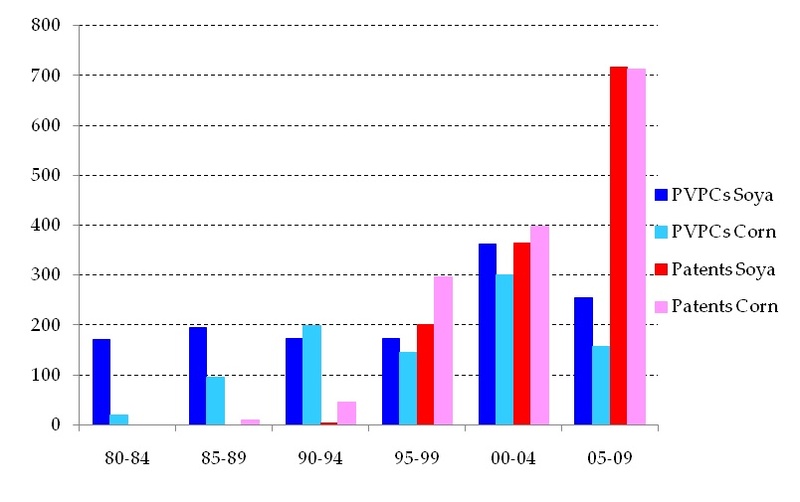 For the purpose of marketing such innovations to farmers, as noted, GM traits need to be combined with elite germplasm, the ownership of which is also rather concentrated and very much affected by the strengthening of IPR protection in this area that has occurred steadily over the last 30 years. Licensing of GM traits is thus an essential component of current industry practices. Allegations of anticompetitive practices in this setting have surfaced repeatedly in recent years (Moss, 2009). They include exclusionary practices such as exclusive dealing arrangements that penalize licensees for dealing with other technology providers, offering rebates to seed distributors who limit sales of competing seeds, and anti-stacking restrictions. A conclusive assessment of the economics of such alleged actions, however, is problematic at present. The licensing of intellectual property entails a number of complex issues, as discussed, and the need to safeguard the incentive role of IPRs means that efficiency effects might be construed even for very restrictive clauses. Also, licensing contracts in this setting are a private matter between the contracting parties, and their details are typically not in the public domain, which is helped by the common practice of settling litigations out of court. An interesting new issue that will be played out in the next few years concerns the potential for “generic” GM traits. Similar to the case of pharmaceuticals, the expiration of patents in principle opens the door for suppliers of generic GM seeds. Many patents typically pertain to any one GM trait, but the last controlling patent for the original soybean Roundup Ready (RR) trait is set to expire in 2014, and the real possibility of having generic versions of RR soybeans is exciting to many observers. The process will not be straightforward, however. The RR trait is wrapped up in branded seeds, and ownership of the underlying germplasm might play a role. If IPRs on such seeds were relying on PVP certificates, then seed saving by farmers might be a viable solution, at least for soybeans. But existing utility patents on GM varieties, which, as noted, have become more and more common in recent years, were they to be asserted, could preclude ready availability of generic GM seeds. There are also a host of regulatory matters that are germane in this case. While it is in the process of replacing the original RR trait in its seeds with a second-generation version with a longer patent protection, as well as other claimed advantages, Monsanto has also promised to maintain global regulatory support, through 2017, for the original RR trait. It is also on record as being willing to help maintain foreign registration beyond that by making available health and safety data needed for regulatory approvals. How all this will play out remains to be seen but, as with other issues in this industry, it will provide newer and challenging material for economic and legal analyses. DOJ and FTC. (1995). Antitrust guidelines for the licensing of intellectual property. Department of Justice and Federal Trade Commission, Washington, D.C.. Economist. (2009). The parable of the sower. The Economist, 21 November 2009, pp. 71-73. Langinier, C., and Moschini, G. (2002). The economics of patents. In S. Newman and M. Rothschild (Eds. ), Intellectual property rights and patenting in animal breeding and genetics (pp. 31-50). Oxfordshire UK: CAB International. Moschini, G. (2008). Biotechnology and the development of food markets: Retrospect and prospects. European Review of Agricultural Economics, 35, 331-355. Moschini, G., and Lapan, H. (1997). Intellectual property rights and the welfare effects of agricultural R&D. American Journal of Agricultural Economics, 79(November), 1229-1242. Moschini, G., and Yerokhin, O. (2007). The economic incentive to innovate in plants: Patents and plant breeders’ rights. In J.P. Kesan (Ed. ), Agricultural biotechnology and intellectual property: Seeds of change (pp. 190-203). Oxfordshire UK: CAB International. Moschini, G., and Yerokhin, O. (2008). Patents, research exemption, and the incentive for sequential innovation. Journal of Economics and Management Strategy, 17, 379-412. Moss, D.L. (2009). Transgenic Seed Platforms: Competition Between a Rock and a Hard Place? American Antitrust Institute White Paper, Washington, D.C., October. GianCarlo Moschini (moschini@iastate.edu) is Professor and Chair, Department of Economics, Iowa State University, Ames, Iowa.